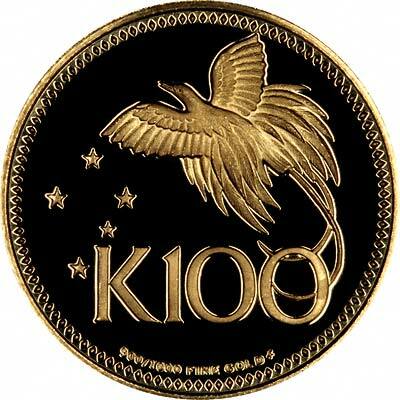 The first coins issued for Papua New Guinea were at its independence in 1975, and included a gold 100 kina, which we show here. The reverse design reflects the national flag, having a soaring bird of paradise in the upper right, flying from right to left, and five stars to the lower left representing the 5 stars of the Southern Cross. Coins of Papua New Guinea were mainly struck by the Franklin Mint. All price subject to fluctuation. Please check current pricing and availability before ordering. 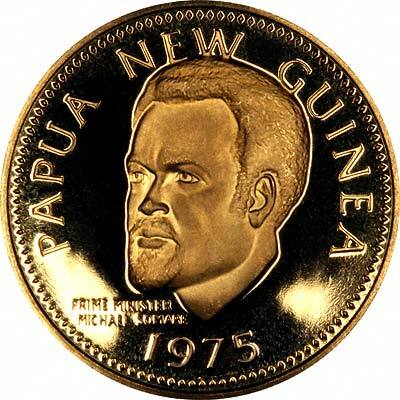 For Papua New Guinea coins in silver or base metal, or Papua New Guinea coin sets other than gold, please look at the Papua New Guinea Coins page of our original website. We make an active market in almost all world coins, gold or otherwise, including Papuan gold coins, whether listed on this page or not. If you have any of these coins to sell, please contact us, or post them to us for appraisal and offer.